Spring has sprung, and its vegetables are at their peak! 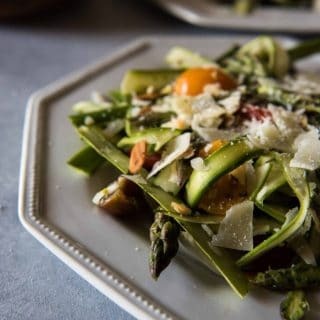 This Spring Asparagus Salad is a wonderful way to showcase raw asparagus – thinly sliced and tossed with tomatoes, almonds, Parmesan, mint, and a simple lemon vinaigrette. Tell me all your thoughts on salad, ’cause I really like to eat it. Not nearly as catchy as that one-hit wonder from the 90s that I ripped those awful, non-rhythmic faux lyrics from, but let’s take this final day of Brunch Week to chat about the wonder of vegetables and how you too can love them like I do. 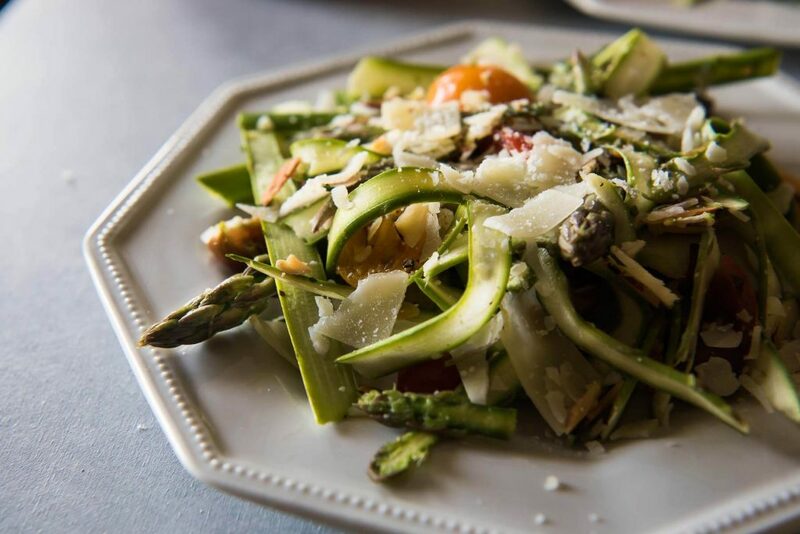 So let’s start by clearing the elephant from the room: asparagus is not only meant to be eaten cooked. If someone had told me that a few weeks ago, I’d have scrunched up my face and disagreed like a kid throwing a tantrum. Vegetables have always been one of those things I enjoy. Nana’s meals often included a veggie of some sort, and as far as I know, I never resisted any of them. I was especially a fan of potatoes and sweet peas – and still am. Green veggies that don’t come from a can are something that I’ve learned to appreciate as an adult. Broccoli was always a favorite but, eventually, I learned how to love spinach, Brussels sprouts, and asparagus. I’m still working on kale. Come June, The Hubs and I will be heading back to the gym (finally using the LA Fitness membership we bought in NOVEMBER,) as well as going on a Ketogenic diet for a while. A food blogger on a diet? The keto diet is a high-fat, moderate protein, low-carb diet that forces your metabolism into what’s called a state of ketosis. It teaches your body to burn fat instead of carbs, essentially turning you into a lean, mean, fat-burning machine. 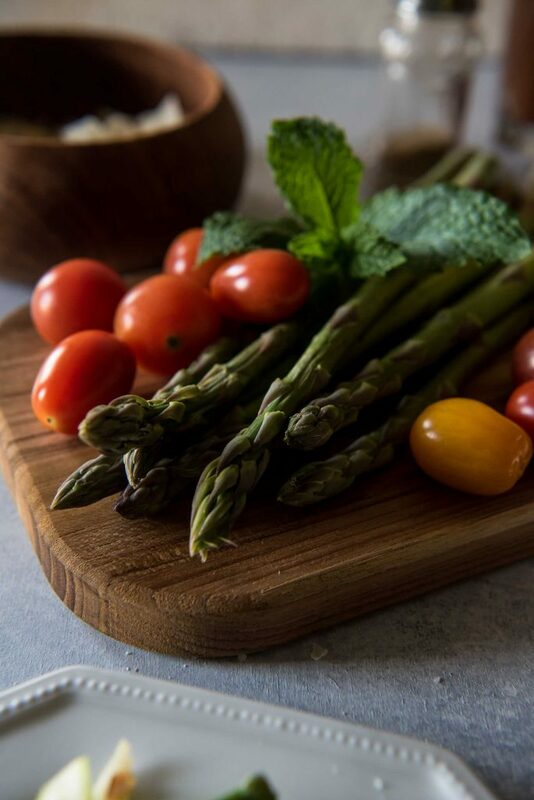 So, while we’ll be getting to eat all the bacon, butter, and avocado that we want, we also have to figure in low-carb veggies, like asparagus. 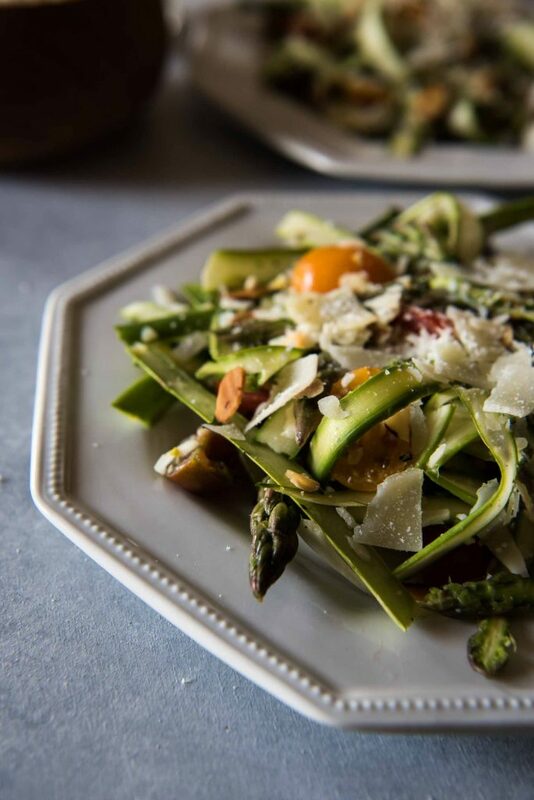 Hence…this Spring Asparagus Salad. Staying away from fruit may be the hardest thing for me. Apparently, on keto, your carb and sugar cravings go from 100 to 0; while I love cake and bread and ice cream, I’ve had a harder time giving up berries and orange juice during my diets of yore. I’m hoping that the little bit of lemon in the vinaigrette won’t be a no-no, because it’s soooooo good. Spring has sprung, and its vegetables are at their peak! 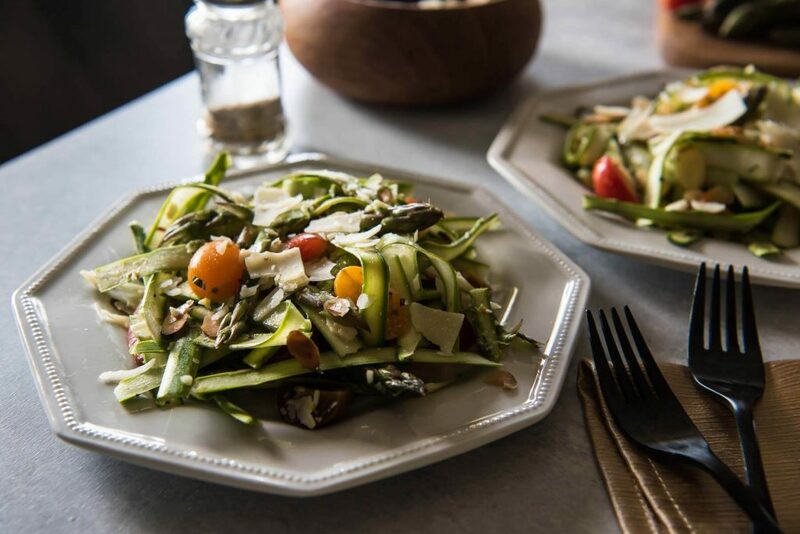 This Spring Asparagus Salad is a wonderful way to showcase raw asparagus - thinly sliced and tossed with tomatoes, almonds, Parmesan, mint, and a simple lemon vinaigrette. Combine the scallions, lemon zest & juice, vinegar, and salt and pepper to taste in a small bowl. Stir and let sit for 15 minutes. Toast the sliced almonds in a medium frying pan over medium-low heat for about 5 minutes, stirring often, until golden brown. Remove from stove top and cool. 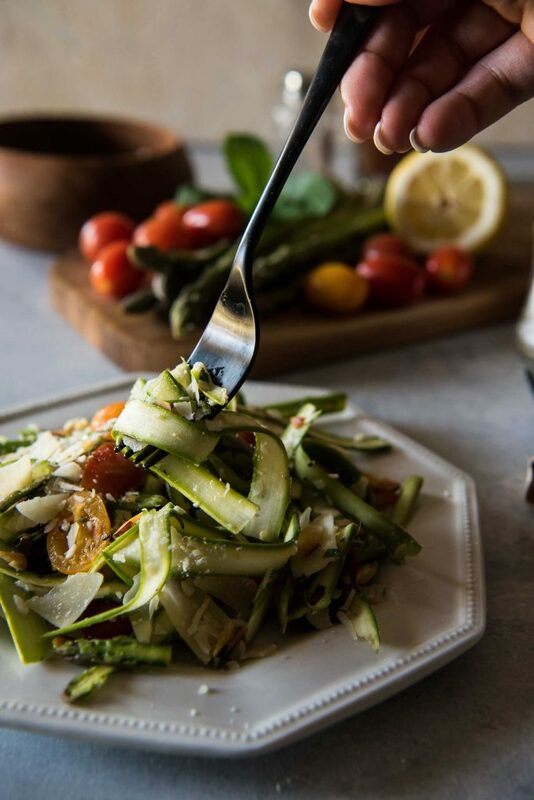 Use a vegetable peeler to thinly slice the asparagus lengthwise into strips. When you get down to the last bit, place the spear flat side down on the handle of a spatula to allow the peeler to move freely. Pace sliced spears in a large bowl with the quartered tomatoes. Drizzle the oil into the lemon-vinegar mixture in a thin and steady stream, whisking constantly. Season to taste with salt and pepper. 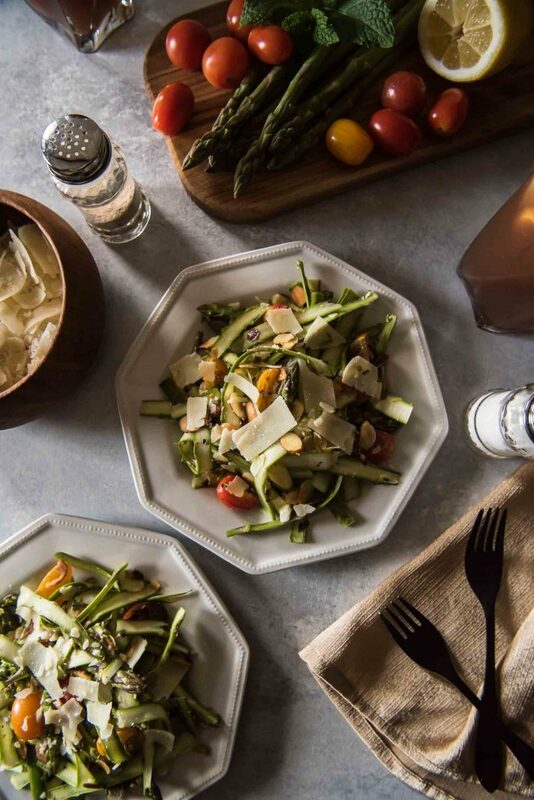 Toss the almonds, mint, half of the cheese, and dressing in with the asparagus and tomatoes. Season again with salt and pepper if desired. 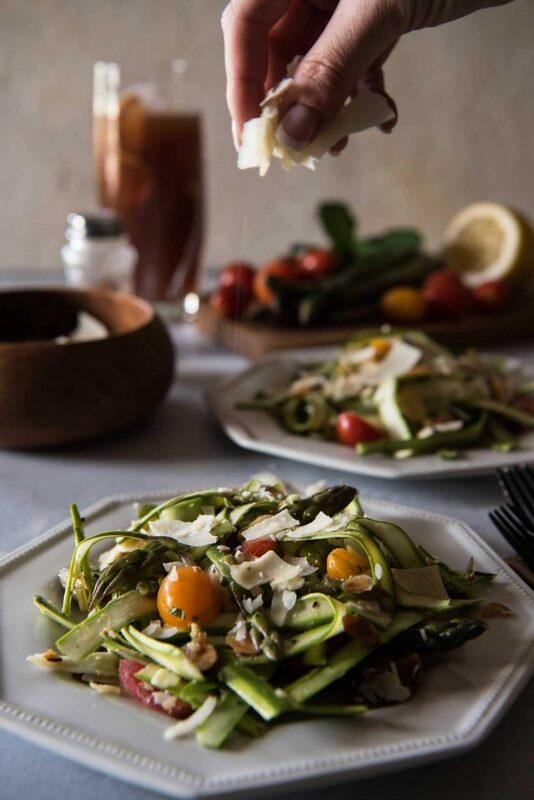 Allow salad to sit at least 10 minutes before serving, then top with remaining cheese.